It's is a pity that it only lived for a day. I would have loved to have seen that thing walking around. wah it is very weird..would of have been crazy to see that.. 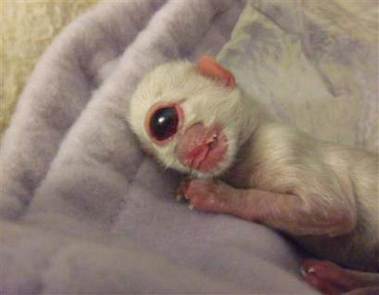 Although there is a possibility for a kitten to be born with 1 eye as it is for a human baby. I have to say that this pic must be fake. 1) Kittens are born with CLOSED eyes. 4) A baby cat can't keep its eyes open in the light until the second week!!! awww thats mean poor kitty or whatever it is!!! the cat is down,i would of loved to see it older. This creature is not weird it is a freak of nature, and despite it only living a short time deserves a more empathetic salute than catering to your immature need to display it and call it weird. Poor Kitty, she/he is beautiful and it dosnt matter at all she/he is perfect I would do anything to get a cat as special as her. She/He is a miracle. i like what jacob had to say. but i do wish the kitten would have had a chance to live. if you look close, it probably had a breathing issue as it seems the nose is not formed as a cat's nose normally would be. also, wondering about the comment on the not having eyes open til 2 weeks old. i have had cats and that is true, they do not open them til then, but this being one of nature's (idk what to say about this, i dont wanna call kitteh freak or not normal) different facial structure, could be the reason its eyes are open.